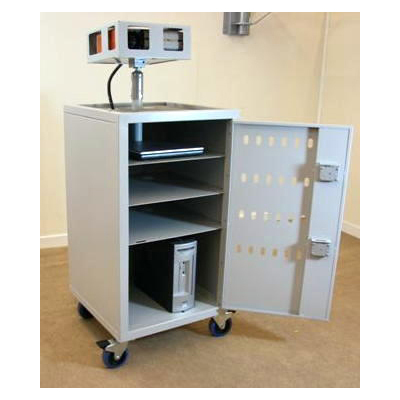 Secure mobile AV trolley allows a permanent projector set up to be shared between user groups with minimum fuss. Includes projector protective case with ball jointed adjustment for complete adjustment control. Completely portable, permanently set up AV trolley with projector protective case. All components remain connected after use – no breaking down time. Cabinet contains 3 shelves – 1 being adjustable to accommodate a variety of configurations. High quality – all welded steel construction with heavy duty casters. Extremely secure, maneuverable AV storage. High security – 2nr 7 lever mortise safe locks with anti-jemmy bar design, all welded construction and full length piano hinges. The trolley may be securely docked in open space, or to the fabric of the building, even in a lockable room for the highest security. Charging kits are available for convenience. Security kit available for protective projector case.